Alan G. Morris is Professor Emeritus in the Department of Human Biology at the University of Cape Town. A Canadian by birth and upbringing, Professor Morris is also a naturalised South African. He has an undergraduate degree in Biology from Wilfrid Laurier University in Waterloo Ontario, and a PhD in Anatomy from the University of the Witwatersrand in Johannesburg. Professor Morris has published extensively on the origin of anatomically modern humans, and the Later Stone Age, Iron Age and Historic populations of Kenya, Malawi, Namibia and South Africa. 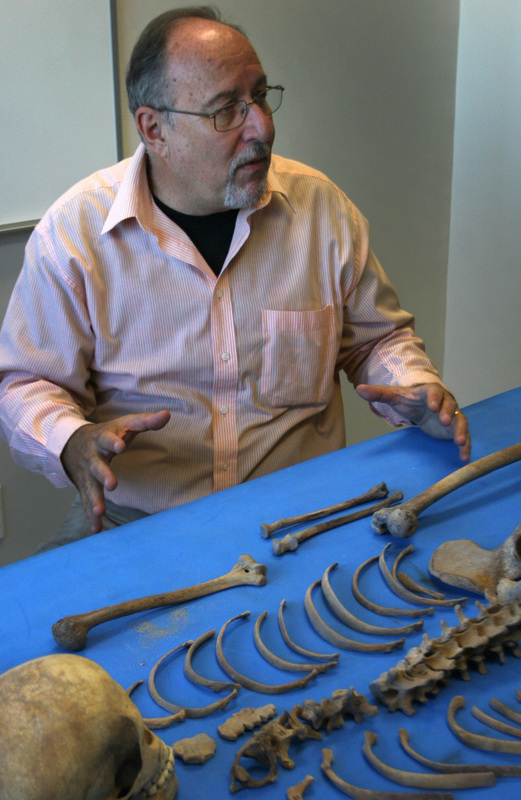 In more recent years he has extended his skeletal biology knowledge to the field of forensic anthropology. He has an additional interest in South African history and has published on the history of race classification, the history of physical anthropology in South Africa and on the Canadian involvement in the Anglo-Boer War. Professor Morris was selected as a visiting Fulbright Scholar in 2012-2013 and spent 9 months at The Ohio State University where he worked with American scholars on the ‘Global History of Health’ project. He is a council member of the Van Riebeeck Society for the Publication of Southern African Historical Documents, was associate editor of the South African Journal of Science from 2009 to 2015 and is an elected member of the Academy of Science of South Africa. Although officially retired, Professor Morris doesn’t seem to understand the concept. He was visiting professor at the Leverhulme Centre for Human Evolutionary Studies at the University of Cambridge for four months in 2015 and is currently continuing research and PhD student supervision. Morris, AG (2015) Interview: Anatomy of an Intellectual Triad – the records of UCT Medical School Anatomy Division. Humanitec Digital showcase 2011 - 2014. Curated and digitised by the Humanitec/UCT Libraries initiative. University of Cape Town. Ribot I, Morris, AG & Renschler, E (in press) Effects of colonialism from the perspective of craniofacial variation: comparing two case studies involving African diaspora populations. In: Murphy, MS. & Klaus, HD. (eds) The Bioarchaeology of Contact and Colonialism. University Press of Florida. Morris, AG (2015) Ancient DNA comes of age. Commentary: South African Journal of Science. 111(5/6). Morris, AG (2014) Going full circle on Khoekhoe origins. The Digging Stick 31(1):1-4. Morris, AG (2013) Technical Note: Human skeletons from sub-Saharan Africa in the Field Museum, Chicago. South African Archaeological Society, Goodwin Series 11:88-89. Meyer A, Steyn, M & Morris AG (2013) A bioarchaeological analysis of the skeletal remains of 36 Chinese indentured mine labourers from the Witwatersrand. South African Archaeological Society, Goodwin Series 11:39-51. Morris, AG & Scholtz, Y (2013) An historical note and preliminary assessment of the human skeletal remains from southern Africa stored in the United Kingdom. South African Archaeological Society, Goodwin Series 11:21-26. Van der Merwe AE, Morris AG, Steyn M & Maat GJR (2013) African skeletal remains housed at the Anatomisch Museum of the Leids Universitair Medisch Centrum. South African Archaeological Society, Goodwin Series 11:13-20. Dembetembe, KA & Morris, AG. (2012) Determining Skeletal Maturation in African males. South African Journal of Science. 108(9/10). Morris, AG (2012) Trauma and violence in the Later Stone Age of southern Africa. South African Medical Journal, 100(6)568-570. Morris, AG & Steyn, M. (2012) Palaeopathological studies in South Africa: a history. In: Buiskstra, J. & Roberts, C. (eds) A History of Palaeopathology. Chapter 33, pp. 235-242. Oxford: Oxford University Press. Morris, AG (2012) Biological Anthropology at the southern tip of Africa: carrying European baggage in an African context. Current Anthropology April 2012, Vol. 53, (S5): S152-S160. Morris, AG (2011) On human evolution, Australopithecus sediba and nation building. News & Views. South African Journal of Science. 107(11/12):10-12. Morris, AG (2010) Racial Identification of single skulls in forensic cases: when myth becomes reality. In: Strkalj, G. (ed). Teaching Human Variation: Issues, Trends and Challenges. Chapter 2: pp.15-31. Hauppauge, NY: Nova Science Publishing.